I made jam. Apple ginger jam from this recipe. Isn’t it pretty? Why did I make jam? To see if I could. I think it’s pretty tasty. Mr. Liu agrees, and he won’t lie to me if I make something gross. He’s been known to order pizza after I’ve made something…. unsuccessful. But, it does not have the consistancy of jam. It’s thick. REALLY thick. Like fruity mortar. I followed the instructions exactly as far as I can tell so I was puzzled by my results. Then I did what any person confronted with this situation would do: I shouted out to the internet in hopes of an answer. An answer came. 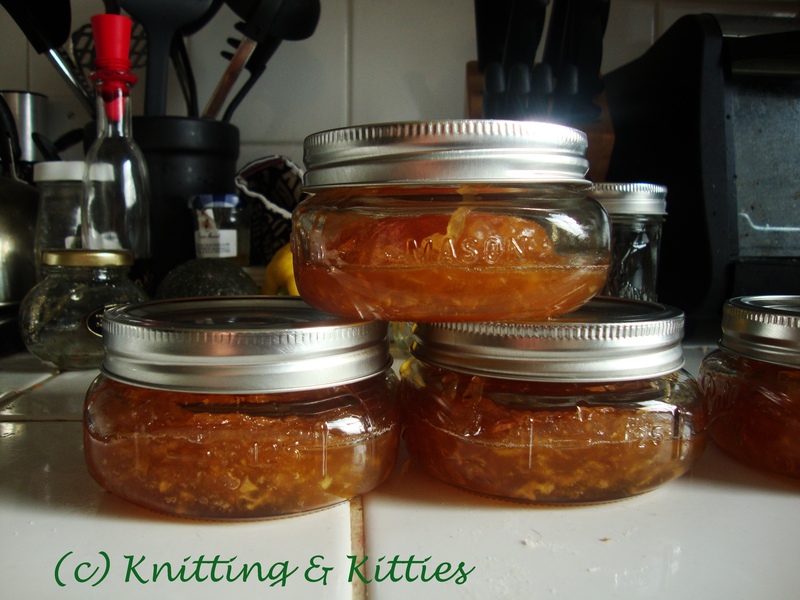 Apples and pineapples jam at a lower temperature than other fruits. This would have been excellent knowledge to have prior to my experiment. Finding this post from the same site wouldn’t have sucked either. I’ll get you next time jam! P.S. I think I’m going to try this one next time. Do oranges do anything crazy I need to know about? This entry was posted in non-yarn craft. Bookmark the permalink.